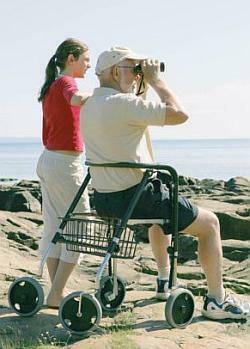 UNFORTUNATELY, due to ill health Enable Holiday Mobility is no longer in operation. If you suffer from a physical disability and are living in or visiting North Cyprus you may notice that there is a distinct lack of facilities for you, and that your trips to town may be more than problematic. Things are changing, albeit extremely slowly, but some property developers are taking note of this when designing communal developments for example. Some of the larger more established hotels have some facilities for disabled visitors, but most only stretch as far as having wheelchair access and lifts to higher floors. Many pavements and roads in North Cyprus are in need of a facelift to allow for the easy use of wheelchairs, or for those who find walking difficult. Money is being invested heavily to make the island more accessible to all, but at the moment it can be difficult for the less physically able visitor. 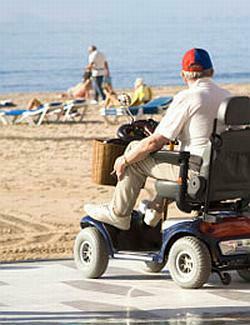 However, if you do have mobility restrictions the good news is that there is a company that has established itself in North Cyprus offering mobility scooters, power-chairs, electric wheelchairs and rollators for hire. The company’s called Enable Holiday Mobility and it’s being run by a lovely couple who have run just such a business for many years in the UK. They can provide a delivery service which is free of charge 10 miles either side of Kyrenia, although they will ask for a small fee for travelling further distances. For the electric vehicles they supply, they also provide a charger for the rental period, as well as ramps for those spots where there are no dropping kerbs. As well as short and long term hire, Enable Holiday Mobility also sells mobility products, as well as selling off their ex-hire models at reduced prices. Visit the website to find out more about the services they can offer you to ensure you get out and about and around Northern Cyprus in comfort and with ease. Please remove all reference to the above website, this unfortunately is due to my enforced retiral due to health reasons. That is really sad to hear. We hope that your health improves. We would like to keep the article up and will put a notice that unfortunately it is no longer in operation and will take off the contact details.